At the award-winning, Design-Build remodeling firm of Harth Builders, they are well acquainted with the frustrations which prompt homeowners to renovate their kitchens. Harth Builders has remodeled kitchens for hundreds of families across Greater Philadelphia since opening their doors in 1996. 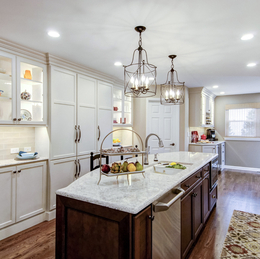 According to NARI Certified Remodeler Gregory Harth, President of Harth Builders, typical triggers for a kitchen renovation range from dilapidated cabinetry, to shortages of counter and storage space, poor lighting, cramped work areas and congested traffic pathways. While new cabinets and countertops may improve the appearance of the kitchen, over the years Greg has learned that most of these kitchen conundrums cannot be solved with superficial fixes. When it comes to creating a dream kitchen environment, he recommends looking beyond the kitchen itself into the adjoining areas of the first floor. By examining how these spaces can be reconfigured to work together harmoniously, that is when homeowners can achieve “First Floor Flow,” which is essential to creating the dream kitchen environment. We recently sat down with Greg to learn more. How did an article about dream kitchens morph into a discussion about the first floor? More often than not, homeowners want kitchens which function better to meet the needs of their unique lifestyles. We help them look at the big picture—their home as a whole. Since the kitchen is the hub of any home, it is central to all the spaces on the typical first floor. To create the ideal kitchen environment, you have to look at how that space is configured in relationship to the adjacent rooms. This is really the critical first step in redesigning a kitchen. You have to understand the traffic patterns and pathways of the first floor—and take the necessary measures to correct any dysfunction that exists. Is First Floor Flow a new design trend? No. Creating flow isn’t about removing walls, like with the open concept trend that was popular a few years back. It’s more of a design philosophy. By examining the needs of the homeowners, we work to create a functional floorplan that will meet the needs of their lifestyle. In that regard, First Floor Flow may look very different for a family with young children, versus a pair of empty nesters. Can you share an example of how you were able to create First Floor Flow for a client? Sure. We recently completed a renovation for a couple in Upper Dublin who had just these sorts of challenges. Their dated kitchen was originally located in the rear of their home. It was cramped and lacked storage space. Whenever they used their backyard, family members and guests were forced to walk through the kitchen to get to the rest of the house, which created many pinch points. As our discussions progressed, we learned that they wanted a mudroom and an office, as well. The solution was a major reconfiguration of the first floor. To find the space we needed for the new layout, we borrowed space from the garage. By adopting the First Floor Flow approach, our Design-Build team was able to deliver a dream kitchen with loads of counter and storage space, as well as a study and a mudroom—all within the budget our clients had established for the project. And, best of all, the rooms flow together seamlessly. To learn more about the Harth Builders First Floor Flow design philosophy, visit them online at HarthBuilders.com or call (215) 654-0364.